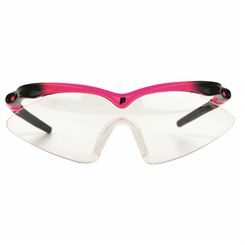 The Karakal Pro 2500 Squash Goggles are ladies / junior size, with adjustable elastic strap or traditional glasses arms. They are super light for outstanding comfort and are ideal for racket sports such as squash and racketball. The Wilson Omni eyewear protection features wraparound design of the Wilson Omni to provide full frontal protection and superior peripheral vision. A moulded nose bridge decreases shock absorption and increases comfort. 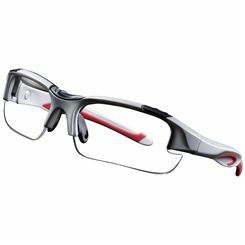 The Wilson Omni eyewear protection has ventilation holes at the temple to prevent eyewear fogging whilst in the heat of your game. 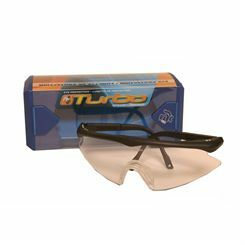 Standing as a must-have accessory for protection from injuries, the Black Knight Guardian squash eyeguards feature an aerodynamic design to suit active playstyle requiring a lot of swift motion, and the polycarbonate lenses offer good resistance to scratching and overall improved durability. Also, the lenses are coated with special Anti-Fog layer to prevent misty vision, to ensure the most comfortable and pleasurable squash experience with added safety. 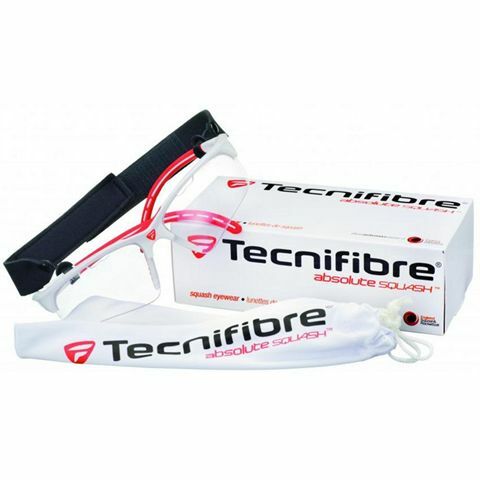 The Tecnifibre Eye Protection Glasses are approved by the England Squash and Racket Ball Association. 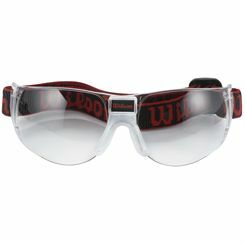 The lenses are made from shatterproof polycarbonate with anti-scratch and anti-fog coating. Fogging is also prevented by vented shield that enhances the air flow. 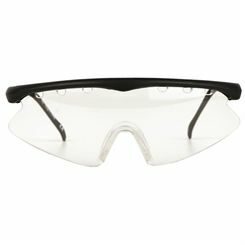 The nylon frame is impact resistant and features curved side arms with rubber grip to hold it in place. 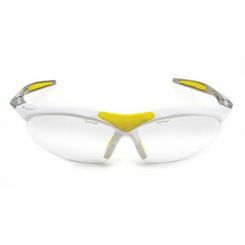 Protection and comfort of wearing is provided by moulded nose piece made from soft rubber. The glasses come with micro fibre cleaning and storage pouch. The good news is that risk of serious eye injury in squash is low, but if you play regularly there is an estimated one in every four chance of receiving an eye injury. Even high level players who ‘keep their eye on the ball’ are not exempt, as former US No. 1 Will Carlin discovered when his retina was torn by a ball impacting his eye and resulting in two operations and permanent impairment of vision. Carlin ordinarily wore protection but had left his goggles in another bag on that unfortunate occasion. 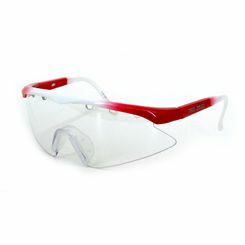 In the UK alone an estimated 15,000 eye injuries occur each year during squash games, so if you don’t want to be such a statistic you can protect your eyes with a small but worthwhile investment. Eye protection is an issue the World Squash Federation (WSF) began addressing formally on 1 January 1999 when it first became compulsory for junior players (19 and under) to wear eye protection while playing. The thinking was that it would engender good habits with the younger players and so establish a healthy habit for life. Today doubles players also have to wear eye protection during games and it’s rare to see any serious player whatever age or level without eye protection. 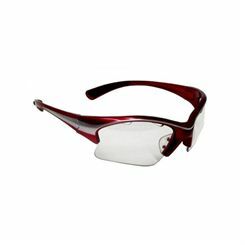 The WSF is working hard to encourage greater uptake of eye protection and many court operators also insist they are worn at least by juniors, if not by all players. 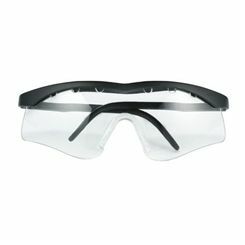 Contact and spectacle wearers can invest in a pair that corrects their vision as well as protecting their eyes, and there is a growing list of manufacturers that meet the WSF’s safety and performance standards. National standards also apply and in the UK the British Standard is BS7930.1. Here at Sweatband we want you to enjoy your game and feel duty bound to recommend eye protection for all players. We always endeavour to bring you the best products at the lowest prices and feel it will probably the most sensible squash investment you make.